Melanin is a natural pigment that gives skin its color while protecting it from sun damage. When our skin over-produces melanin, however, it can cause unsightly dark spots. These dark spots, known as hyperpigmentation, are a source of frustration for many people. Are you curious to learn what causes hyperpigmentation and how to treat it? Keep reading! Hyperpigmentation happens when melanin forms deposits in certain spots of the skin, making the affected area look darker than its surroundings. Hyperpigmentation can affect all ages, genders, and ethnicities. However, it is more common in women. ● Age or “liver” spots, which are caused by sun exposure. Age spots are usually found on skin that is frequently exposed to the sun, like the face, chest, and hands. ● Melasma, which appears as splotchy dark areas on the face. 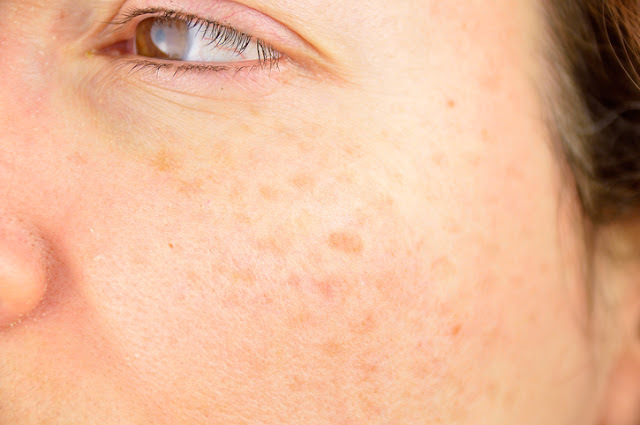 Melasma spots are typically much larger than age spots, and they are usually related to hormonal changes like pregnancy or birth control pills. Sun and heat (like from a sauna) can cause melasma to spread. ● Post-inflammatory hyperpigmentation, which crops up in response to pimples, bug bites, and other abrasions. ● Small spots of hyperpigmentation called freckles. Freckles are genetic in origin, but can get darker with sun exposure. All types of hyperpigmentation are made worse by UV rays, so the number one rule of preventing hyperpigmentation is to wear sunscreen daily. Use a broad spectrum sunscreen and reapply for every two hours of sun exposure. Wear a hat and avoid direct sun exposure if at all possible. To prevent post-inflammatory hyperpigmentation, resist the urge to pick at your skin. Cover cuts or scrapes with a bandage to allow the skin to heal without interference from the sun. As a general rule of thumb, new hyperpigmentation spots are more easy to treat than older ones. A dark spot from a pimple will usually clear up on its own, while an age spot that’s developed after years in the sun is more difficult to fade. To treat existing hyperpigmentation, use a physical exfoliant like a scrub on the affected area. Exfoliants improve skin cell turnover while buffing away dead, dull skin. Follow exfoliation with a lotion or serum containing brightening ingredients like vitamin C, niacinamide, willow bark, or licorice root. If these solutions fail to make a difference, try using a product that contains hydroquinone. Hydroquinone is a powerful compound that slows the production of melanin to even out the skin tone. However, hydroquinone makes skin more sensitive to sunlight, so it’s important to take extra precautions to guard against UV rays when using this ingredient. For serious cases of hyperpigmentation, visit your dermatologist. Your dermatologist may recommend chemical peels, laser treatments, or microneedling to renew skin cells and reveal a more even-toned complexion. Fading hyperpigmentation can take several months. Without proper sun protection, hyperpigmentation can reemerge after treatment, so keep wearing that sunscreen!